It is this act of translation (the probing through dictionaries; the melodic transposing of sound and sense; the investing; the uncovering) that is useful for the creative writer. This activity demands the writer/translator to implement personal constraints, incase himself/herself with the culture of the text, and thereby render it new. John Dryden, like numerous other theorist/writers of the eighteenth century, used the metaphor of the translator/portrait painter to maintain that the painter has the duty of making his portrait resemble the original. Considering this metaphor from a modern perspective, the degree of “literalness” in a translator’s rendering can range on a scale from “photo-realism” to “abstract.” Therefore, it shouldn’t seem too much of a leap to consider ekphrastic poetry a form of translation, where the writer renders the visual art into a tangible, literary medium. Or to understand how translation ties itself to Oulipian exercises, which use constraints as a means of triggering unique inspirations within the writer/translator, inducing him/her to craft something unexpected. Georges Perec, a member of Oulipa, said, “[when I write] I set myself rules in order to be totally free.” His novel La disparition is a lipogram, written without using the letter “e” in French. Eventually, Gilbert Adair published an English translation of the text entitled A Void, where he also constrained himself from using the letter “e”. In doing so, Adair created a different text from Perec: a transubstantiated version. With every translation, no matter how “literal” or “abstract,” the writer/translator is filtering the original text through themselves. Therefore, every piece is unique, a re-birthing of the original. I find translating comparable, in a way, to crafting a collage or putting a puzzle together. The pieces are given to you in a box, where you can sift through them and discover what fits together, what pairs well. However, these pieces are malleable. You can do what you like to them: bend, cut, color, etc. And you’re not enforced to their use alone. You can incorporate other pieces and objects from anywhere in the world. It is an investigative art project, where the goal is to produce what you find to be an “accurate” representation of the source material. Through this active process, you will have filtered the source through your core, conceived something new. In the end, you will have become a rendering of your former self. 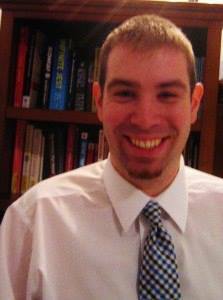 ABOUT KEVIN: Kevin Dwyer is a PhD Graduate Assistant focusing in poetry and a native of Hawthorne, NY. He earned his Honors BA from Saint Louis University and his MA with a focus in creative writing from Fordham University. Kevin received an Honorable Mention prize from the Academy of American Poets at Fordham University for his poem “Here Testified.” His chapbook In Memoriam was published via Yellow Flag Press, along with his poems “The Snow, the Crow, and the Blood” and “Time Marches On” which appear in Vision/Verse 2009-2013: An Anthology of Poetry. At the moment, Kevin is working on his dissertation involving a creative translation of various runes, Anglo-Saxon texts, and Ancient Egyptian hieroglyphics.